South Africa has successfully made significant gains in the fight against HIV, AIDS and tuberculosis. “South Africa is a great example of what governments around the world can do to help defeat global pandemics such as HIV and AIDS, tuberculosis and malaria,” said Dr Mark Dybul after a meeting with President Jacob Zuma. In his first official visit to South Africa as Executive Director of the Global Fund to Fight AIDS, Tuberculosis and Malaria, Dr Dybul met with President Zuma to discuss advancing the fight against infectious diseases in the country. The country’s boost to domestic financing of programmes that seek to defeat these diseases has led to a lowering of numbers for new patients. 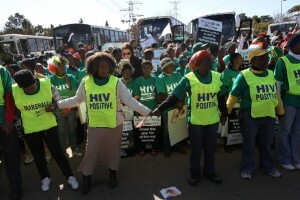 South Africa’s government has stepped up domestic financing of HIV programmes to cover approximately 82 per cent of the country’s total HIV and AIDS expenditure. Support from international funding mechanisms such as the Global Fund and the president’s Emergency Plan for AIDS Relief (PEPFAR) has also been significant. With 1.9 million people on treatment as of June 2012, South Africa has the largest antiretroviral drug programme in the world. Life expectancy has been improved from 54 years to 60 years in a very short space of time, claims the Global Fund. Since its inception in 2002, the Global Fund has committed 3.66 billion rand for HIV and AIDS in the country. Dr. Dybul informed President Zuma of a recent decision by the Global Fund board to approve an additional 216 million rand for HIV programmes in South Africa. Kgalema Motlanthe, South Africa’s Deputy President welcomed the announcement of the new funding by Global Fund and said that it will further boost South Africa’s fight against HIV and TB. “The announcement of additional funding by the Global Fund demonstrates the ongoing commitment by global partners to work together in the fight against HIV and TB,” Motlanthe said.